Watch out Apple! Sony is clearly gunning for a chunk of your stylish retail business by partnering with a name known for its popularity amongst customers and its excellent support and services: Comcast. Updated. Anyone who is feeling masochistic tomorrow and wants to check this place out, please let us know how it is. It's located on the ground floor of the Comcast Center at 17th and JFK Boulevard. PHILADELPHIA – March 16, 2009 – Sony Electronics Inc., a world leader in consumer electronics and technology, and Comcast Corp. (Nasdaq: CMCSA, CMCSK), the nation's leading provider of entertainment, information and communications, are partnering to open a unique retail experience in the Comcast Center: Sony Style Comcast Labs. Sir Howard Stringer, chairman and CEO of Sony Corporation, and Brian L. Roberts, chairman and CEO of Comcast, conceived the idea as a destination where consumers could learn about emerging technologies and experience new digital devices. The co-branded retail store and technology lab, which opens to the public tomorrow, will showcase the latest innovative products and services from both companies and preview future Comcast technology, products and services. "This is another great example of innovation and consumer technology being showcased in Philadelphia by Comcast. Comcast has attracted great partners like Sony that continue to benefit our citizens with cool products," said Philadelphia Mayor Michael Nutter. 1) The Future of High-Speed Internet: 100 Mbps surfing and downloading live. 2) The Future of Home Phone Service: the enhanced cordless telephone – forget smart phones, this one is a genius with email, IM, text and Yellow Pages. "Consumer electronics are becoming increasingly advanced, and the strategy behind the Sony Style stores has always been to create a comfortable environment where consumers interact with and educate themselves about the latest technology," said Stan Glasgow, president and COO of Sony Electronics in the U.S. "At Sony Style Comcast Labs, trained staff show consumers how to unlock the full potential of their devices by demonstrating how Comcast's advanced delivery services integrate beautifully with Sony's hardware products and entertainment content." "Innovation has been the cornerstone of all that we do at Comcast and this new interactive space is the perfect showcase for our current and future technology," said Tony Werner, Comcast's chief technology officer. "We're thrilled to have this unique space anchor our corporate headquarters as a clear demonstration of innovation. It's also a terrific, hands-on way for consumers to experience how all our products work together." 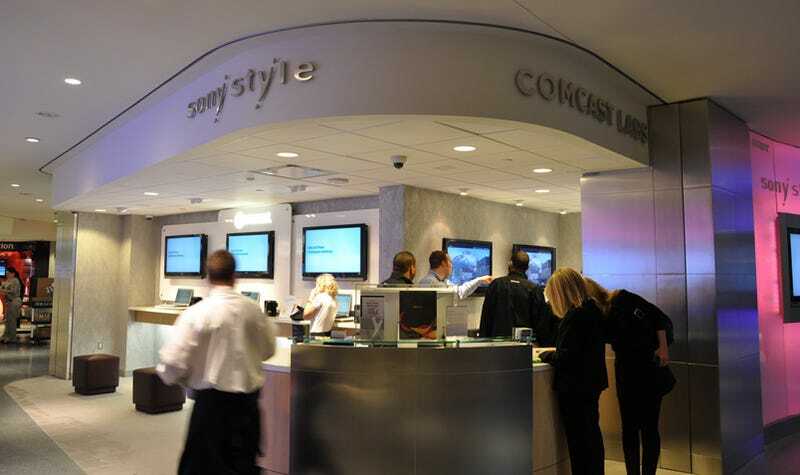 Sony Style Comcast Labs feature the best of Sony's electronics and the most innovative service offerings from Comcast. Sony Electronics offerings include BRAVIAÒ high definition LCD televisions, VAIO® PCs, a (alpha) DSLR and Cyber-shotÒ digital cameras, HandycamÒ camcorders, PSPÒ and PlayStationÒ 3 game consoles and emerging technologies like OLED (Organic Light Emitting Diode) TVs. Comcast will showcase all of its products and services from voice to video and Internet and demonstrate how they each work together seamlessly for the consumer. Shoppers will have opportunities to make informed purchase decisions about what best fits their needs via personalized service and product demonstrations from in-store Sony Electronics and Comcast representatives. The Sony Style Comcast Labs is located the heart of The Market at the base of the Comcast Center in Philadelphia at 17th and JFK Boulevard.